Spring is here again. The sight of fat kereru straining young branches and the sound of the tuis calling to each other and harassing the occasional blackbird mean all their babies will be hatching soon! So if you are keen on helping them out with a little extra tucker here are some helpful tips. Bread: - many people give bread to the birds. In winter, sparrows and other introduced birds such as mynas and starlings are quick to eat this up. Do remember that bread has salt in it and too much salt is not good for birds. In spring, when birds are nesting, the young chicks need protein in their diet, so cut down on the bread. The birds will then look for their own food and the chicks will have a varied diet. Do not feed mouldy bread to any birds. Seeds: - Seeds will bring in the introduced finches as well as the sparrows. You can use seeds from a pet shop or supermarket, or make your own up by buying different loose seeds and mixing it together. Some people buy lard, melt it and then add the seeds. When cold, this can be cut up, put into a fine net bag, and suspended from the tree, or hung off the bird table. Household scraps can also be added to bird cakes. Do not give desiccated coconut or salted peanuts, as this is not good for birds. Fruit: - Orange, grapefruit, apple and pear may be cut up and left on the bird table. Waxeyes and even tuis may come to love this fare. Remember that some birds may target your fruit trees. Do not put out any type of fruit that you want to harvest yourself. Alternatively, you may decide to share your fruit with the birds. Kiwi fruit is becoming a problem plant pest in some areas, please do not feed the birds this fruit as the seeds may cause the plant to grow in the bush. Sugar water: - The native and endemic nectar eating birds such as tuis, bellbirds and waxeyes, welcome containers of sugar water when nectar flowering trees are in short supply. You will need a cup of sugar dissolved in 1 litre of warm water. When cooled place in a container in a tree that is visited by tui and bellbirds. Obviously birds should be fed up high or in a large open area where cats cannot easily sneak up on them! While visiting us here at the clinic, you may have met our Matix. He is a lovely Burmese boy who unfortunately is diabetic and has been for some time. 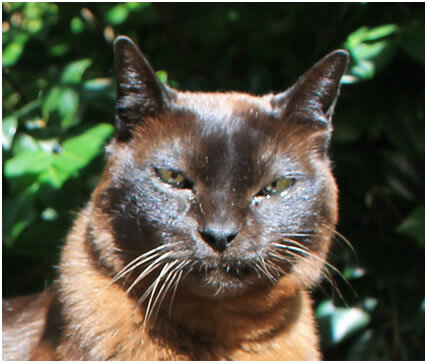 Burmese cats in NZ, Australia and the UK are genetically prone to developing diabetes. Other risk factors include being a male cat, over 10 years old and overweight. Diabetes mellitus is diagnosed through blood and urine testing, immediate treatment is often necessary. Diabetes mellitus occurs when the body doesn't produce or doesn't properly use insulin. Insulin is a hormone produced in the pancreas that is responsible for regulating the flow of glucose from the bloodstream into the cells. Glucose is a fuel that provides the energy needed to sustain life. Left untreated, diabetes will shorten a cat's lifespan. A dangerous, sometimes fatal condition called ketoacidosis may develop. Ketoacidosis begins when the body uses protein and fat as an energy source resulting in blood poisoning. This requires prompt intensive care. Diabetes treatment generally involves twice daily injections of insulin. Obesity is a major factor in insulin sensitivity, so if your cat is overweight you will need to help them lose weight gradually. Diet is also an important step in treating your cat. The veterinary team can help you with this.